French Valley Ranch's Giant Schnoodles and Miniature Schnauzers - NEWSFLASH!! GIANT SCHNOODLE BABIES READY FOR EARLY CHRISTMAS GIVING FOR YOUR FAMILY! CURRENT BABIES ARE PRICED AT $1000.00 (HALF PRICE FEMALE PUPPIES BORN IN JUNE), $2000.00 FOR BLACK F1'S JUST READY FOR HOMES NOW AND $2200.00 FOR BRAND NEW COLORED BABIES READY IN TIME FOR CHRISTMAS! WE HAVE ONE LITTER OF COLORED BABIES READY FOR CHRISTMAS! !\\ THESE ARE $2200.00 PLUS FLIGHT IF NEEDED. FLIGHT NANNY CAN FLY THESE TO SEATTLE DEC. 22 AND LAS VEGAS DEC. 21. FOUR GIRLS ON LEFT AND TO BOYS ON RIGHT. WILL BE DOING MORE PHOTOS WHEN EYES OPEN!MALES BELOW!FEMALES BELOW!PUPPIES BELOW ARE THE JUNE F1 FEMALES!THESE BABIES ARE ALL CRATE TRAINED, DOGGY DOOR TRAINED, SUPER SOCIALIZED AND STARTED ON LEASH WALKING. SUPER NICE BABIES!WE HAVE GORGEOUS F1 GIANT SCHNOODLE BABIES AVAILALE AND READY NOW!! WE HAVE TWO GORGEOUS FEMALE GIANT SCHNOODLE PUPPIES BORN JUNE 2018 ARE HALF PRICE ($1000.00 PLUS FLIGHT COSTS)! THESE PUPPIES HAVE HAD 3 SETS OF PUPPY VACCINES AND RABIES VACCINE & MICRO-CHIPPED TOO! READY TO GET OUT IN THE PUBLIC NOW! THEY ARE ALSO CRATE TRAINED, DOGGY DOOR TRAINED AND SUPER SOCIALIZED. THEY ARE ALSO MICROCHIPPED AND WORMED TOO! ONE OF OUR JUNE 2019 BABY GIRLS BELOW! SUPER GORGEOUS BLACK F1 GIANT SCHNOODLE BABIES BORN END OF AUGUST AND MIDDLE OF SEPT 2018 AND JUST READY FOR HOMES NOW!. WE CURRENTLY HAVE MALES AND FEMALES AVAILABLE! THESE ARE $2000.00 PLUS FLIGHT IF NEEDED. AVAILABLE AUGUST 2018 FEMALES ABOVE AND BELOW! AVAILALBE FEMALES ABOVE AND MALES BELOW!HUGE MALE BORN AUGUST 2019 BELOW IS CURRENTLY AVAILABLE! THIS IS THE PERFECT TIME OF YEAR TO GET A PUPPY AND SETTLED IN BEFORE WINTER HITS! FLIGHTS FOR FLYING PUPPIES ARE ALL CURRENTL20 ﻿WE HAVE A TWO OF OUR LARGEST JUNE 2018 BABIES (HUGE MALE AND HUGE FEMALE) JUST STARTING TRAINING FOR BALANCE & SUPPORT SERVICE DOG WORK! THESE TWO ARE CURRENTLY PRICED AT $3500.00 MALE, AND $2500.00 FEMALE. WE GOT THE RESULTS BACK FROM PAW PRINTS GENETIC HEALTH TESTING LAB ON THE 16 HEATH TESTS THEY RECOMMENDED FROM BROTHER TO OUR CURRENT AVAILABLE GIANT SCHNOODLE BABIES WHO IS CURRENTLY IN SERVICE DOG TRAINING. ALL 16 TESTS WERE CLEAR!! NO CARRIER & NO AFFECTED!! WHOOP WHOOP! THE BEST WE CAN BE IN OUR BREEDING PROGRAM! !﻿ THIS IS IN ADDITON TO ALL OUR CLEAR TESTS (HIPS, ELBOWS, CERF, SA, THYROID, CARDIAC, ADDISON'S ETC ON OUR PARENT DOGS! PLEASE START WITH READING THE "MUST READ" PAGE BEFORE BUYING ANY PUPPY FOR TIPS AND INFORMATION. VERY INFORMATIVE. WE HAVE JUST ONE VERY SWEET BABY GIRL BORN SEPT. 2017 WHO IS READY FOR A HOME AND SHE IS ALSO CURRENTLY OFFERED IN THE HALF PRICE SPECIAL TOO!!! PLEASE CLICK ON THE PAGE LINKS TO THE RIGHT FOR ADDITONAL INFORMATION. 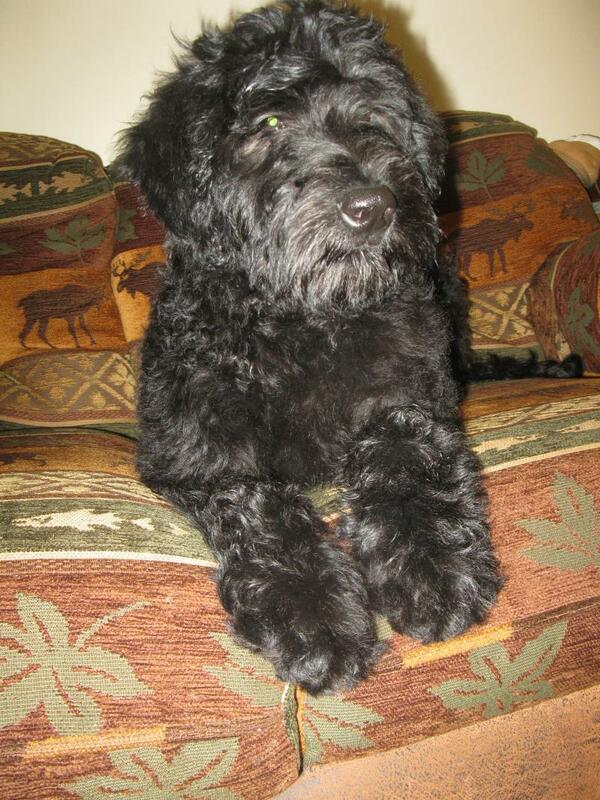 WE HAVE NEW F1 BLACK GIANT SCHNOODLE PUPPIES READY FOR HOMES NOW!! ZUESS AND DAUGHTERS OF YOSHI & COCOA ARE THE PARENTS! SCHNOODLE BABIES ARE $2000.00 EACH. NEXT LITTER IS PLANNED FOR SPRING 2019! PICTURES BELOW ARE THE CURRENT BABIES WE HAVE AVAILABLE FOR HOMES NOW. E-MAIL US FOR VIDEOS WE CAN TEXT YOU TOO, SEVEN PICTURES DIRECTLY BELOW ARE CURRENT JUNE 2019 BABIES AVAILABLE NOW AND HALF PRICE AT $1000.00 FOR A LIMITED TIME!!! LARGE MALE ABOVE. LARGE FEMALE BELOW! LARGE FEMALE ABOVE AND LARGE MALE BELOW.SMALLER FEMALE BELOWSMALLEST FEMALE BELOWLARGE FEMALE BELOW THEY WERE PLAYING WITH THE KIDS WITH THEIR NEW SUMMER HAIRCUTS!ONE SEPT 2017 FEMALE AVAILABLE BELOW & SAME PUPPY IN THE ABOVE PICTURES WITH HER HAIRCUT! DON'T MISS OUT. SHE IS AN EXCEPTIONAL PUPPY AND WE HAVE STARTED SOME BASIC TRAINING TOO!WHO COULDN'T LOVE THIS FACE!! SUPER SWEET SEPT. 2017 FEMALE WHO IS CURRENTLY AVAILABLE! !OUR BIG GIRL! JUNE 2019 FEMALE BABY (WHO IS AVAILABLE) OUT FOR A WALK IN HER WINTER WOOLIES! !WE ARE EXPECTING MINIATURE SCHNAUZER BABIES SOON! PETS ARE $1200.00. CURRENT BABIES ON THE WAY ARE OUT OF OUR NEW TOP SIRE GORGEOUS GEORGE AND OUR SUPER SNOOP!! NEW PICTURES ON THE MINIATURE SCHNAUZER PAGE! PICTURE BELOW IS OUR 5 YEAR OLD GRANDDAUGHTER WITH HER FIRST PUPPY "DUKE!" FROM GRANDMA & GRANDPA FOR CHRISTMAS! About Us, Puppy Guarantee and prices for puppies and adults. E-MAIL US AGAIN PLEASE IF YOU DIDN'T GET AN ANSWER RIGHT AWAY. WE ARE OUT IN THE FIELD AND RUNNING WITH RANCH ACTIVITES AND WITH OUR KIDS. SOME OF THE E-MAILS ARE NOT COMING THROUGH. ALL OUR PAST PUPPIES HAVE TESTED HIGH FOR GREAT FAMILY DOGS, AND SEVERAL HAVE GONE ON TO BE SERVICE & THERAPY DOGS. SMART, HAPPY & EAGER TO PLEASE. ALL ARE GORGEOUS WAVY COATS! THEY ARE SUPER SOCIALIZED, HAPPY AND LOVE PEOPLE! PET MINIATURE SCHNAUZER BABIES ARE $1200.00. OUR 9 MONTH OLD GRANDDAUGHTER SOCIALIZING WITH ONE OF OUR PAST FEMALE GIANT SCHNOODLE BABIES (NOW NAMED RAINEY AND AT HOME IN LAS VEGAS)! RAINEY IS A SIBLING TO OUR CURRENT LITTER! MOMMA CHANEL WITH HER NEW BABIES RIGHT AFTER BIRTH BELOW!CHANEL HAS HER BABIES NOW (ZUESS IS THE SIRE) AND IS RETIRED WITH THIS LITTER. WE HAVE ONE LARGE AWSOME MALE AVAILABLE FROM THIS LITTER! !MOMMA TIMBER BELOW WITH HER FINAL LITTER, NOW RETIRED AND IN HER RETIREMENT HOME WITH DIANA & FAMILY IN CALIFORNIA! OUR PAST BABIES WITH SAME BLOODLINES AS CURRENT BABIES PICTURED BELOW. OUR BABIES ARE SUPER SWEET & HAPPY ARE SUPER SOCIALIZED AND LOVED. MINIATURE SCHNAUZER PET PUPPIES ARE SPAYED/NEUTERED, & HAVE CURRENT PUPPY VACCINATIONS, WORMED & ARE MICRO-CHIPPED. AKC PEDIGREES E-MAILED TO YOU AFTER PURCHASE ON REQUEST, BUT NO REGISTRATION PAPERS ARE GIVEN ON PET ONLY PUPPIES. PET MINIATURE SCHNAUZER BABIES ARE $1200.00. DISCRIMINATE SHOW/BREED HOMES ARE OCCASIONALY APPROVED AND THOSE PUPPIES ARE SOLD WITH FULL AKC REGISTRATION FOR $3500.00.BLUE & BLACK GIANT SCHNOODLE PUPPIES ARE $2000.00. FLIGHT COSTS ARE EXTRA.NON DASH FLIGHT COST S ARE RIGHT AT $400.00 IN THE LOWER 48. LAST YEARS PUPPIES ARE PICTURED BELOW. 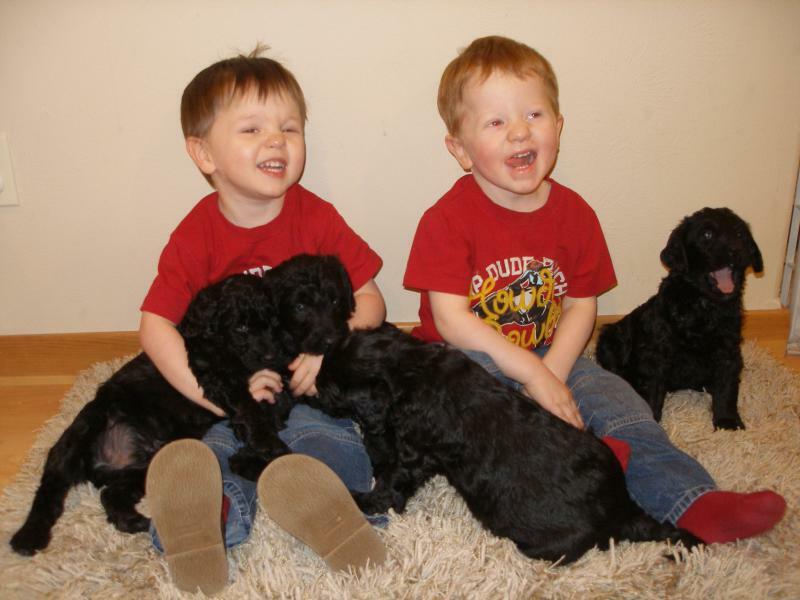 FEMALE GIANT SCHNOODLE GIRLS BELOW ARE NOW IN ANCHORAGE & MILWAKEE!TWO PICTURES OF COLORED GIANT SCHOODLE PUPPIES BELOW WITH MY TWIN BOYS! COLORED GIANT SCHOODLE BABY GIRL ABOVE IS NOW IN HER NEW HOME. NEXT COLORED LITTER IS HERE AND READY NOW! OUR IMMEDIATE FUTURE BREEDING PROGRAM WILL FOCUS ON OUR 40 YEARS OF MINIATURE SCHNAUZERS AND OUR ALMOST 20 YEAR GIANT SCHNOODLE PERFECTION! THESE ARE THE ONLY TWO BREEDS WE ARE FOCUSING ON CURRENTLY. one gorgeous black female below WENT home to Allison in Tacoma! OUR CURRENT BABIES HAVE THE SAME SIRE AND LOOK JUST LIKE HER! OUR FINAL LITTER (EVER) OF GIANT SCHNAUZERS ARRIVED ON JULY 19, 2016! ALL are now in their FOREVER homes! E-MAIL IS BETTER THAN PHONE CALLS AS WE ARE AWAY FROM THE LAND LINE OR ANY PHONE MOST OF THE TIME .E-MAIL: EDTAMIALEXANDER2@YAHOO.COM OUR GIANT SCHNOODLE PUPPIES ARE HERE ! WON'T HAVE ANY MORE BABIES UNTIL FALL 2018. FALL & SPRING IS A GOOD TIME FOR A NEW BABY SO THEY CAN FINISH THEIR PUPPY BOOSTERS & BE PROTECTED FOR YOUR SUMMER OUTINGS. THIS GIVES EVERYONE A CHANCE, INCLUDING US, TO TAKE THEIR SUMMER VACATIONS AND HAVE A DEAD OF WINTER REST AND BE READY TO WELCOME A NEW ADDITION WHEN EVERYTHING SLOWS DOWN. TAKING 1/2 DOWN PICK ORDER DEPOSITS NOW TO SECURE YOUR NEW BABY AS THEY FIND HOMES VERY QUICKLY. THREE OF PAST BABY BOYS PICTURED BELOW ARE NOW IN THEIR WONDERFUL NEW HOMES IN MINNESOTA AND OMAHA! OUR STANDARD POODLE SIRE "YOSHI" AND "COCOA". THESE TWO ARE THE PARENTS OF OUR CURRENT AKC POODLE MOM'S IN OUR BREEDING PROGRAM. YOSHI IS STILL CURRENTLY ONE OF OUR GIANT SCHNOODLE SIRES. pICTURED WITH ONE OF OUR TWINS, JOSEPH BELOW.OUR BROWN SUPER SWEET STANDARD POODLE COCOA, SHOWN ABOVE WITH yOSHI AND ONE OF OUR TWIN BOYS IS NOW IN HER RETIRMENT HOME! cOCOA AND yOSHI ARE THE PARENTS TO OUR CURRENT sTANDARD pOODLE DAMS. thREE & FOUR GENERATIONS OF OUR SUPER rOYAL pOODLE FAMILY! PREVIOUS MINIATURE SCHNAUZER BOYS BELOW. Update!! this is the time we have commited for our babies for this year. most questions you might have are answered in our links to the right. please read through & LOOK AT THE PRICES (WE ARE FIRM) INFORMATION AND GUARANTEES if you have questions. GORGEOUS SWEET GIANT SCHNOODLE GIRL PICTURED BELOW IS NOW IN HER NEW HOME IN CHICAGO WITH PETER!!! TAKING DEPOSITS NOW FOR SPRING 2018 LITTER AND WE HAVE CURRENT BABIES READY NOW! OUR PUPPIES ARE SUPER HAPPY, CRATE TRAINED, SOCIALIZED AND CONFIDENT. THEY LOVE EVERYONE AND MELT IN YOUR ARMS WHEN YOU HOLD THEM! TAKING PICK ORDER DEPOSITS ON UPCOMING 2017 LITTERS. WE HAVE HAD PEOPLE WITH DISABLITLITES ASKING AT LEAST ONCE A WEEK FOR A FREE OR DISCOUNTED PUPPY. WE ADVISE EVERYONE TO DO FUNDRAISERS TO PURCHASE THEIR DOGS & PAY FOR THE SPECIALIZED TRAINING IF THEY CAN'T AFFORD ONE. PAST FEMALE MINIATURE SCHNAUZER PUPPIES ARE NOW IN THEIR NEW HOMES!! our ranch is closed for visits (WE ARE only ARRANGING PICK UP DAYS FOR YOUR NEW FAMILY MEMBER AND MUST BE DURING THE WEEK. wE ARE NOT AVAILABLE ANY WEEK-END AS WE HAVE FAMILY ACTIVITES GOING ON). this is necessary due to a large and dangerous construction project which should be finished SOMETIME WITHIN THE NEXT YEAR. TOO MANY TRIP ZONES WITH CONSTUCTION MATERIALS AND WE DON'T WANT ANYONE GETTING HURT! IF YOU ARE PLANNING TO COME TO OUR RANCH FOR ANY REASON, PLEASE READ OUR VISIT POLICY FIRST AND REMEMBER TO ARRANGE YOUR SCHEDULE TO COME ON A WEEK-DAY AS WE ARE NOT AVAILABLE ON THE WEEK-ENDS FOR FAMILY TIME!! OUR WEBSITE IS FOR LOOKY LEWS. RANCH VISTS ARE FOR PUPPY PICK-UPS ONLY WHEN YOU ARE FULLY READY FOR A NEW FAMILY MEMEBER AND PREPARED TO TAKE YOUR BABY HOME THAT DAY. WE DON'T HAVE A FULL TIME KENNEL FOR GENERAL PUBLIC VISITS. THIS IS OUR HIGH END AND TIME CONSUMING HOBBY FROM OUR HOME. WE HAVE REGULAR JOBS AND FAMILY TO WORK AROUND. we are normLLY not at the house to answer phone calls. We WILL return E-MAIL messages when we get a chance, SO PLEASEe-mail us at edtamialexander2@yahoo.com as you will get a quicker response. Thanks to all of you for providing the best homes for our babies!!! past puppy pictures and some adults are featured below!!! past newborn miniature schnauzer puppies pictured below!! MINIATURE SCHNAUZER puppies abOVE RIGHT AFTER BIRTH!!! PICTURED BELOW IS 4 YEAR OLD "KELLEN" WITH HIS GRANDPARENT'S NEW BABY "CHLOIE", CHLOIE IS IN HER FOREVER HOME. PEOPLE KEEP ASKING IF SHE IS AVAILABLE> SHE IS NOT, BUT WE HAVE BABIES WITH THE SAME BLOODLINES THAT LOOK JUST LIKE HER. CHLOIE IS OUT OF ONE OF OUR TOP SIRES "SNOOP".KELLEN IS ONE OF OUR FEQUENT PUPPY SOCIALIZERS! our FINAL (FOREVER) LITTER OF AKC Standard Poodle Puppies pictured beloW at 8 weeks old, (ready to come play with me!) right before leaving for their new homes!! !four of these five went to show homes!!!! OUR FINAL LITTER OF STANDARD POODLES AND FINAL LITTER OUT OF COCOA AND YOSHI! WE KEPT TWO AWESOME GIRLS OUT OF THIS GROUP TO ARE NOW IN OUR SCHNOODLE BREEDING PROGRAM! PAST LITTER OF AKC STANDARD POODLE puppies at 7 weeks, TWO WHO ARE NOW IN OUR BREEDING PROGRAM! akc miniature schnuazer puppies pictured below are in their new homes! Thanks Irene, Kendra & Adam, Marlene & Tracey!!! here is a link to a video of two pups out of our previous group that went to the drain family https://www.youtube.com/watch?v=oGCKZtOmnxMThanks so much to you for making this awesome video and for letting us use it. coming up puppies have the same bloodlines and will look just like these! PICTURED BELOW ARE OUR TWIN BOYS WITH OUR 11 MONTH OLD (AT THE TIME OF PHOTO) PHANTOM GIANT SCHNOODLE!!! Super sweet!! please go to the breed pages for more info & pictures. lower photos are of some of our previous puppies showing what our puppies are. past puppies below!!! giant schnoodle puppy below "duke" is now at home with Tasha in texas! black & silver akc miniature schnauzer pups (past litter) shown below at FIVE weeks old! thanks to everyone who gave our past babies wonderful homes!Enjoy their pictures below!Pictured below at 6 1/2 weeks old with jacob holding little runtie! PICTURED BELOW (2 PICTURES) ON OCT 13 2013 AT 5 1/2 WEEKS! OUTSIDE PLAYTIME!! ABSOLUTELY LOVE OUR KIDS!! 2014 litter shown below 1st time outside with our twins. Please see our giant schnoodle page for more information & more photos. http://www.youtube.com/watch?v=w8ySGnsQ6kk&feature=youtu.beUpper link is a video "Cole" of one of our last summer's Giant Schnauzer puppies the week he went to Wyoming into a service dog training program for Rollie. His friend produced the video. This is an example of what you'll get in one of our pups. Story is coming on Giant Schnauzer page. We now have several Giant Schnoodles in service and therapy dog training programs too. upper & lower photos are our male miniature schnauzer puppies now in thier colorado home! lower photo is of our giant schnoodle puppy who went to arizona to be trained for dustin's service dog! our past platnium silver litter of akc Miniature schnauzer puppies below! giant schnoodle male below is now at home in new mexico!!! These four pictures show puppies out for a little spin around the yard.. our twin boys and giant schnoodle puppies playing!puppies are all extremely outgoing already at four weeks old and love peoplE! giant schoodle litter four weeks old. upper photo 1st time outside in potty play pen!! they loved it! OCCASIONALLY WE HAVE RETIRED FEMALE ADULTS AVAILABLE. MINIATURE SCHNAUZERS AND STANDARD POODLES.MINIIMUM ADOPTION FEE WHICH HELPS WITH ALL THE VET WORK, GROOMING, COLLAR & LEASH. pRICED BY AGE AND ROUTINE VET COST (SPAY, DENTAL & CURRENT VACCINATIONS) TO GET THEM READY FOR NEW HOMES. Please scroll all the way down for complete details, then go to the breed pages for more information and photos!!! e-mail us at EDTAMIALEXANDER2@YAHOO.COM FOR MORE INFO. one of our CURRENT top Miniature Schnauzer sires "snoop" his pedigree is almost solid top akc champions including his dam, grandparents, and that's just the beginning! are three boys are from different top bloodlines, helping our breeding program to be awesome! please contact us for details. LOWER PHOTOS ARE OF SOME OF OUR PREVIOUS PUPPIES PLAYING WITH OUR KIDS AND PUPS GIANT SCHNOODLE PUPPIES AS THEY MATURED. OUR 5 YEAR OLD'S PLAYING WITH OUR PREVIOUS PUPPIES AT 7 WEEKS OLD. LOWER TWO PICTURES ARE PUPPIES AT 7 WEEKS OLD. PLEASE SCROLL ALL THE WAY DOWN THIS PAGE TO SEE WHAT OUR PAST GIANT SCHNOODLE PUPPIES OF THIS BLOODLINE LOOKED LIKE AS THEY MATURED. This is our climate-controlled "doggy room!" Our dogs can go in and outside as they please through their doggy doors during the day. Each individual dog gets to sleep in their own special little spot at night! WE HAVE VERY BUSY SUMMERS TRAVELING AND WITH OUR CROP HARVEST. WE ARE PLAYING CATCH UP AND BEHIND ON ANSWERING E-MAILS DURING THE SUMMER MONTHS. IF YOU TRIED TO CONTACT US AND HAVEN'T HEARD BACK YET, PLEASE TRY AGAIN AS WE ARE BUSY WITH NEW PUPPIES TOO. PLEASE CLICK ON THE PAGE LINKS TO THE RIGHT FOR ADDITONAL INFORMATION. PLEASE CLICK ON THE PAGE LINKS TO THE RIGHT FOR ADDITONAL INFORMATION. NFORMATION. NFORMATION. 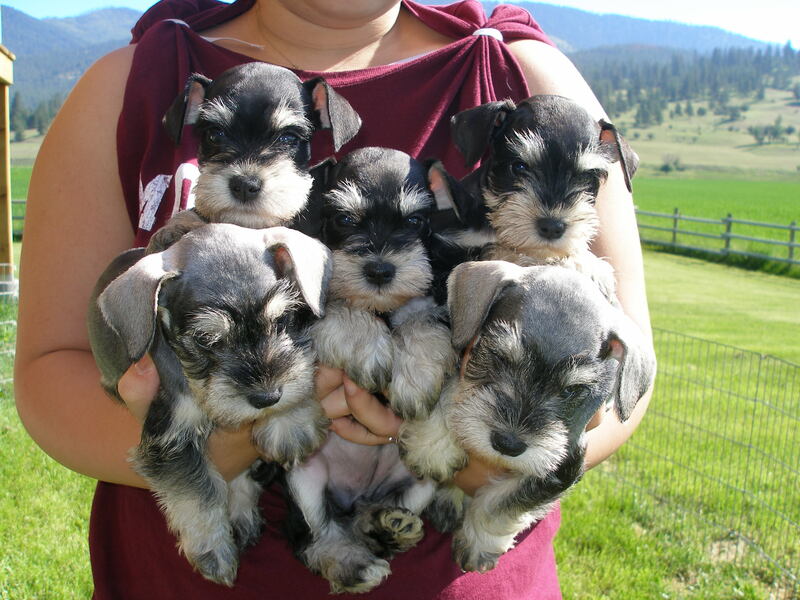 Miniature sCHNAUZER puppies for sale. 40 years perfecting for health and temperament!! ALL OF OUR BABIES ARE NON-SHEDDING AND HYPO ALLERGENIC. MANY GENERATIONS OF CLEAR HEALTH AND TEMPERAMENTS. MUST READ BEFORE PURCHASING ANY PUPPY FROM ANYWHERE! About Us, Puppy Guarantee and prices for puppies and adults. Contact Us, Visit Policy & Adoption fees and deposits. MINIATURE SCHNAUZER PUPPIES EXPECTED SOON!! 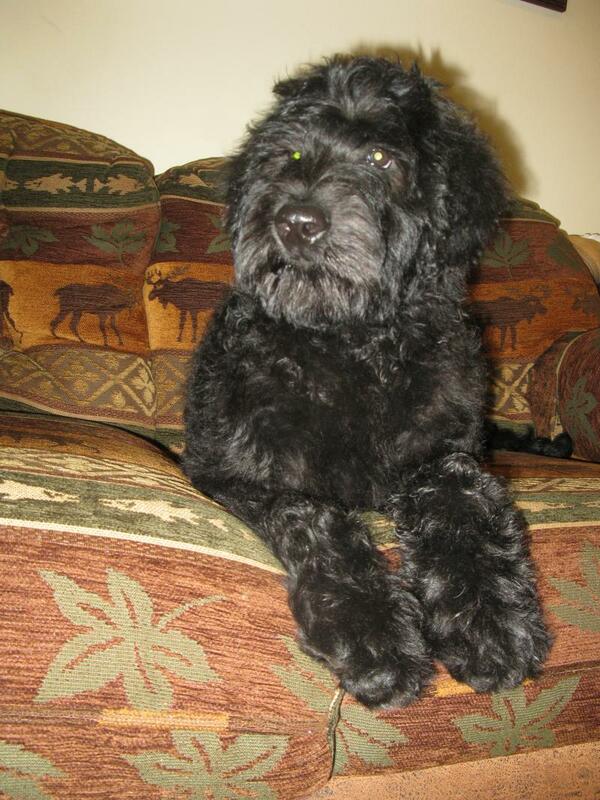 WE HAVE A SUPER GORGEOUS BLACK F1 GIANT SCHNOODLE BABIES READY NOW!!! OUR FINAL LITTER OF GIANT SCHNAUZER PUPPIES CAME TO BE IN THE SUMMER OF 2016. 40 YEARS OF THIS GREAT BREED! NOW OUR GREAT BLOODLINES ARE CARRIED ON WITH OUR GIANT SCHNOODLES. BACKGROUND HERE! HOMECOMING PHOTOS OF GIANT SCHNOODLE PUPPIES AND GROUP OF OUR AKC STANDARD POODLE SIRES AND PUPPIES!!! NEWSFLASH!! GIANT SCHNOODLE BABIES READY FOR EARLY CHRISTMAS GIVING FOR YOUR FAMILY! CURRENT BABIES ARE PRICED AT $1000.00 (HALF PRICE FEMALE PUPPIES BORN IN JUNE), $2000.00 FOR BLACK F1'S JUST READY FOR HOMES NOW AND $2200.00 FOR BRAND NEW COLORED BABIES READY IN TIME FOR CHRISTMAS! WE HAVE ONE LITTER OF COLORED BABIES READY FOR CHRISTMAS! !\ THESE ARE $2200.00 PLUS FLIGHT IF NEEDED. FLIGHT NANNY CAN FLY THESE TO SEATTLE DEC. 22 AND LAS VEGAS DEC. 21. FOUR GIRLS ON LEFT AND TO BOYS ON RIGHT. WILL BE DOING MORE PHOTOS WHEN EYES OPEN! PUPPIES BELOW ARE THE JUNE F1 FEMALES! THESE BABIES ARE ALL CRATE TRAINED, DOGGY DOOR TRAINED, SUPER SOCIALIZED AND STARTED ON LEASH WALKING. SUPER NICE BABIES! WE HAVE GORGEOUS F1 GIANT SCHNOODLE BABIES AVAILALE AND READY NOW!! WE HAVE TWO GORGEOUS FEMALE GIANT SCHNOODLE PUPPIES BORN JUNE 2018 ARE HALF PRICE ($1000.00 PLUS FLIGHT COSTS)! THESE PUPPIES HAVE HAD 3 SETS OF PUPPY VACCINES AND RABIES VACCINE & MICRO-CHIPPED TOO! READY TO GET OUT IN THE PUBLIC NOW! THEY ARE ALSO CRATE TRAINED, DOGGY DOOR TRAINED AND SUPER SOCIALIZED. THEY ARE ALSO MICROCHIPPED AND WORMED TOO! ONE OF OUR JUNE 2019 BABY GIRLS BELOW! SUPER GORGEOUS BLACK F1 GIANT SCHNOODLE BABIES BORN END OF AUGUST AND MIDDLE OF SEPT 2018 AND JUST READY FOR HOMES NOW!. WE CURRENTLY HAVE MALES AND FEMALES AVAILABLE! THESE ARE $2000.00 PLUS FLIGHT IF NEEDED. AVAILABLE AUGUST 2018 FEMALES ABOVE AND BELOW! AVAILALBE FEMALES ABOVE AND MALES BELOW! HUGE MALE BORN AUGUST 2019 BELOW IS CURRENTLY AVAILABLE! ﻿WE HAVE A TWO OF OUR LARGEST JUNE 2018 BABIES (HUGE MALE AND HUGE FEMALE) JUST STARTING TRAINING FOR BALANCE & SUPPORT SERVICE DOG WORK! THESE TWO ARE CURRENTLY PRICED AT $3500.00 MALE, AND $2500.00 FEMALE. WE GOT THE RESULTS BACK FROM PAW PRINTS GENETIC HEALTH TESTING LAB ON THE 16 HEATH TESTS THEY RECOMMENDED FROM BROTHER TO OUR CURRENT AVAILABLE GIANT SCHNOODLE BABIES WHO IS CURRENTLY IN SERVICE DOG TRAINING. ALL 16 TESTS WERE CLEAR!! NO CARRIER & NO AFFECTED!! WHOOP WHOOP! THE BEST WE CAN BE IN OUR BREEDING PROGRAM! !﻿ THIS IS IN ADDITON TO ALL OUR CLEAR TESTS (HIPS, ELBOWS, CERF, SA, THYROID, CARDIAC, ADDISON'S ETC ON OUR PARENT DOGS! PLEASE START WITH READING THE "MUST READ" PAGE BEFORE BUYING ANY PUPPY FOR TIPS AND INFORMATION. VERY INFORMATIVE. WE HAVE JUST ONE VERY SWEET BABY GIRL BORN SEPT. 2017 WHO IS READY FOR A HOME AND SHE IS ALSO CURRENTLY OFFERED IN THE HALF PRICE SPECIAL TOO!!! PLEASE CLICK ON THE PAGE LINKS TO THE RIGHT FOR ADDITONAL INFORMATION. 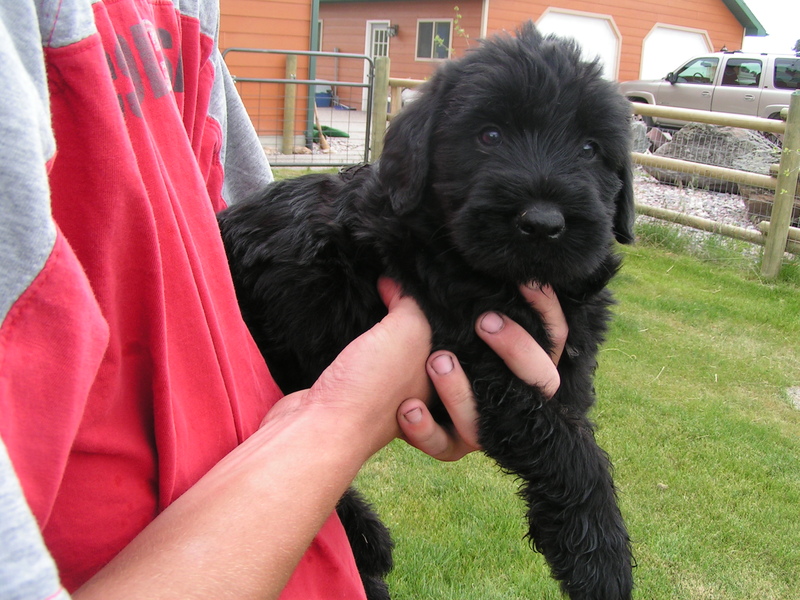 WE HAVE NEW F1 BLACK GIANT SCHNOODLE PUPPIES READY FOR HOMES NOW!! ZUESS AND DAUGHTERS OF YOSHI & COCOA ARE THE PARENTS! SCHNOODLE BABIES ARE $2000.00 EACH. NEXT LITTER IS PLANNED FOR SPRING 2019! SEVEN PICTURES DIRECTLY BELOW ARE CURRENT JUNE 2019 BABIES AVAILABLE NOW AND HALF PRICE AT $1000.00 FOR A LIMITED TIME!!! LARGE MALE ABOVE. LARGE FEMALE BELOW! LARGE FEMALE ABOVE AND LARGE MALE BELOW. THEY WERE PLAYING WITH THE KIDS WITH THEIR NEW SUMMER HAIRCUTS! ONE SEPT 2017 FEMALE AVAILABLE BELOW & SAME PUPPY IN THE ABOVE PICTURES WITH HER HAIRCUT! DON'T MISS OUT. SHE IS AN EXCEPTIONAL PUPPY AND WE HAVE STARTED SOME BASIC TRAINING TOO! WHO COULDN'T LOVE THIS FACE!! SUPER SWEET SEPT. 2017 FEMALE WHO IS CURRENTLY AVAILABLE!! OUR BIG GIRL! JUNE 2019 FEMALE BABY (WHO IS AVAILABLE) OUT FOR A WALK IN HER WINTER WOOLIES!! WE ARE EXPECTING MINIATURE SCHNAUZER BABIES SOON! PETS ARE $1200.00. CURRENT BABIES ON THE WAY ARE OUT OF OUR NEW TOP SIRE GORGEOUS GEORGE AND OUR SUPER SNOOP!! NEW PICTURES ON THE MINIATURE SCHNAUZER PAGE! PICTURE BELOW IS OUR 5 YEAR OLD GRANDDAUGHTER WITH HER FIRST PUPPY "DUKE!" FROM GRANDMA & GRANDPA FOR CHRISTMAS! E-MAIL US AGAIN PLEASE IF YOU DIDN'T GET AN ANSWER RIGHT AWAY. WE ARE OUT IN THE FIELD AND RUNNING WITH RANCH ACTIVITES AND WITH OUR KIDS. SOME OF THE E-MAILS ARE NOT COMING THROUGH. ALL OUR PAST PUPPIES HAVE TESTED HIGH FOR GREAT FAMILY DOGS, AND SEVERAL HAVE GONE ON TO BE SERVICE & THERAPY DOGS. SMART, HAPPY & EAGER TO PLEASE. ALL ARE GORGEOUS WAVY COATS! THEY ARE SUPER SOCIALIZED, HAPPY AND LOVE PEOPLE! PET MINIATURE SCHNAUZER BABIES ARE $1200.00. OUR 9 MONTH OLD GRANDDAUGHTER SOCIALIZING WITH ONE OF OUR PAST FEMALE GIANT SCHNOODLE BABIES (NOW NAMED RAINEY AND AT HOME IN LAS VEGAS)! RAINEY IS A SIBLING TO OUR CURRENT LITTER! MOMMA CHANEL WITH HER NEW BABIES RIGHT AFTER BIRTH BELOW! CHANEL HAS HER BABIES NOW (ZUESS IS THE SIRE) AND IS RETIRED WITH THIS LITTER. WE HAVE ONE LARGE AWSOME MALE AVAILABLE FROM THIS LITTER!! MOMMA TIMBER BELOW WITH HER FINAL LITTER, NOW RETIRED AND IN HER RETIREMENT HOME WITH DIANA & FAMILY IN CALIFORNIA! OUR PAST BABIES WITH SAME BLOODLINES AS CURRENT BABIES PICTURED BELOW. OUR BABIES ARE SUPER SWEET & HAPPY ARE SUPER SOCIALIZED AND LOVED. MINIATURE SCHNAUZER PET PUPPIES ARE SPAYED/NEUTERED, & HAVE CURRENT PUPPY VACCINATIONS, WORMED & ARE MICRO-CHIPPED. AKC PEDIGREES E-MAILED TO YOU AFTER PURCHASE ON REQUEST, BUT NO REGISTRATION PAPERS ARE GIVEN ON PET ONLY PUPPIES. PET MINIATURE SCHNAUZER BABIES ARE $1200.00. DISCRIMINATE SHOW/BREED HOMES ARE OCCASIONALY APPROVED AND THOSE PUPPIES ARE SOLD WITH FULL AKC REGISTRATION FOR $3500.00. BLUE & BLACK GIANT SCHNOODLE PUPPIES ARE $2000.00. NON DASH FLIGHT COST S ARE RIGHT AT $400.00 IN THE LOWER 48. LAST YEARS PUPPIES ARE PICTURED BELOW. 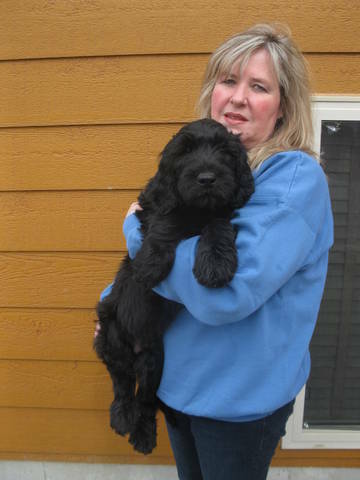 FEMALE GIANT SCHNOODLE GIRLS BELOW ARE NOW IN ANCHORAGE & MILWAKEE! 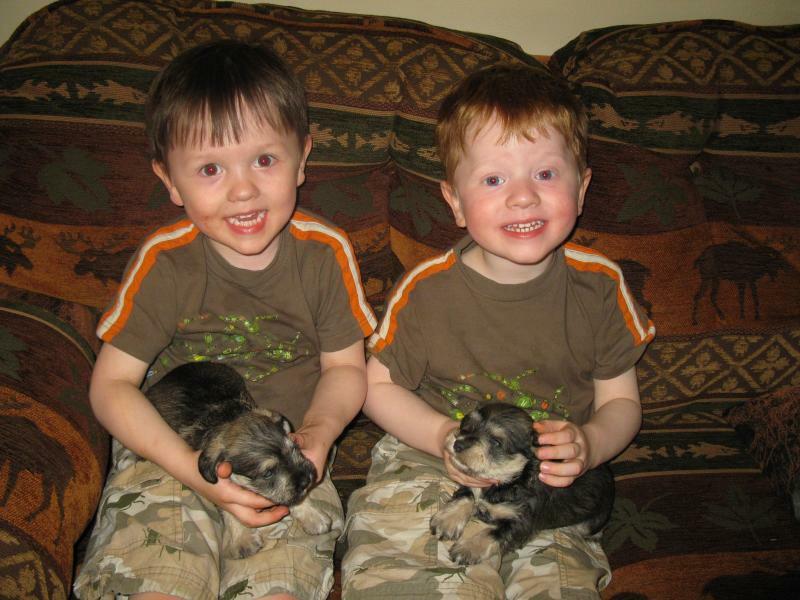 TWO PICTURES OF COLORED GIANT SCHOODLE PUPPIES BELOW WITH MY TWIN BOYS! COLORED GIANT SCHOODLE BABY GIRL ABOVE IS NOW IN HER NEW HOME. NEXT COLORED LITTER IS HERE AND READY NOW! OUR IMMEDIATE FUTURE BREEDING PROGRAM WILL FOCUS ON OUR 40 YEARS OF MINIATURE SCHNAUZERS AND OUR ALMOST 20 YEAR GIANT SCHNOODLE PERFECTION! THESE ARE THE ONLY TWO BREEDS WE ARE FOCUSING ON CURRENTLY. one gorgeous black female below WENT home to Allison in Tacoma! OUR CURRENT BABIES HAVE THE SAME SIRE AND LOOK JUST LIKE HER! OUR FINAL LITTER (EVER) OF GIANT SCHNAUZERS ARRIVED ON JULY 19, 2016! ALL are now in their FOREVER homes! E-MAIL IS BETTER THAN PHONE CALLS AS WE ARE AWAY FROM THE LAND LINE OR ANY PHONE MOST OF THE TIME . OUR GIANT SCHNOODLE PUPPIES ARE HERE ! WON'T HAVE ANY MORE BABIES UNTIL FALL 2018. FALL & SPRING IS A GOOD TIME FOR A NEW BABY SO THEY CAN FINISH THEIR PUPPY BOOSTERS & BE PROTECTED FOR YOUR SUMMER OUTINGS. THIS GIVES EVERYONE A CHANCE, INCLUDING US, TO TAKE THEIR SUMMER VACATIONS AND HAVE A DEAD OF WINTER REST AND BE READY TO WELCOME A NEW ADDITION WHEN EVERYTHING SLOWS DOWN. TAKING 1/2 DOWN PICK ORDER DEPOSITS NOW TO SECURE YOUR NEW BABY AS THEY FIND HOMES VERY QUICKLY. THREE OF PAST BABY BOYS PICTURED BELOW ARE NOW IN THEIR WONDERFUL NEW HOMES IN MINNESOTA AND OMAHA! WITH ONE OF OUR TWINS, JOSEPH BELOW. OUR BROWN SUPER SWEET STANDARD POODLE COCOA, SHOWN ABOVE WITH yOSHI AND ONE OF OUR TWIN BOYS IS NOW IN HER RETIRMENT HOME! cOCOA AND yOSHI ARE THE PARENTS TO OUR CURRENT sTANDARD pOODLE DAMS. thREE & FOUR GENERATIONS OF OUR SUPER rOYAL pOODLE FAMILY! PREVIOUS MINIATURE SCHNAUZER BOYS BELOW. this is the time we have commited for our babies for this year. most questions you might have are answered in our links to the right. please read through & LOOK AT THE PRICES (WE ARE FIRM) INFORMATION AND GUARANTEES if you have questions. GORGEOUS SWEET GIANT SCHNOODLE GIRL PICTURED BELOW IS NOW IN HER NEW HOME IN CHICAGO WITH PETER!!! TAKING DEPOSITS NOW FOR SPRING 2018 LITTER AND WE HAVE CURRENT BABIES READY NOW! OUR PUPPIES ARE SUPER HAPPY, CRATE TRAINED, SOCIALIZED AND CONFIDENT. THEY LOVE EVERYONE AND MELT IN YOUR ARMS WHEN YOU HOLD THEM! TAKING PICK ORDER DEPOSITS ON UPCOMING 2017 LITTERS. WE HAVE HAD PEOPLE WITH DISABLITLITES ASKING AT LEAST ONCE A WEEK FOR A FREE OR DISCOUNTED PUPPY. WE ADVISE EVERYONE TO DO FUNDRAISERS TO PURCHASE THEIR DOGS & PAY FOR THE SPECIALIZED TRAINING IF THEY CAN'T AFFORD ONE. PAST FEMALE MINIATURE SCHNAUZER PUPPIES ARE NOW IN THEIR NEW HOMES!! our ranch is closed for visits (WE ARE only ARRANGING PICK UP DAYS FOR YOUR NEW FAMILY MEMBER AND MUST BE DURING THE WEEK. wE ARE NOT AVAILABLE ANY WEEK-END AS WE HAVE FAMILY ACTIVITES GOING ON). this is necessary due to a large and dangerous construction project which should be finished SOMETIME WITHIN THE NEXT YEAR. TOO MANY TRIP ZONES WITH CONSTUCTION MATERIALS AND WE DON'T WANT ANYONE GETTING HURT! IF YOU ARE PLANNING TO COME TO OUR RANCH FOR ANY REASON, PLEASE READ OUR VISIT POLICY FIRST AND REMEMBER TO ARRANGE YOUR SCHEDULE TO COME ON A WEEK-DAY AS WE ARE NOT AVAILABLE ON THE WEEK-ENDS FOR FAMILY TIME!! OUR WEBSITE IS FOR LOOKY LEWS. RANCH VISTS ARE FOR PUPPY PICK-UPS ONLY WHEN YOU ARE FULLY READY FOR A NEW FAMILY MEMEBER AND PREPARED TO TAKE YOUR BABY HOME THAT DAY. WE DON'T HAVE A FULL TIME KENNEL FOR GENERAL PUBLIC VISITS. THIS IS OUR HIGH END AND TIME CONSUMING HOBBY FROM OUR HOME. WE HAVE REGULAR JOBS AND FAMILY TO WORK AROUND. e-mail us at [email protected] as you will get a quicker response. Thanks to all of you for providing the best homes for our babies!!! past puppy pictures and some adults are featured below!!! past newborn miniature schnauzer puppies pictured below!! MINIATURE SCHNAUZER puppies abOVE RIGHT AFTER BIRTH!!! PICTURED BELOW IS 4 YEAR OLD "KELLEN" WITH HIS GRANDPARENT'S NEW BABY "CHLOIE", CHLOIE IS IN HER FOREVER HOME. PEOPLE KEEP ASKING IF SHE IS AVAILABLE> SHE IS NOT, BUT WE HAVE BABIES WITH THE SAME BLOODLINES THAT LOOK JUST LIKE HER. CHLOIE IS OUT OF ONE OF OUR TOP SIRES "SNOOP". KELLEN IS ONE OF OUR FEQUENT PUPPY SOCIALIZERS! our FINAL (FOREVER) LITTER OF AKC Standard Poodle Puppies pictured beloW at 8 weeks old, (ready to come play with me!) right before leaving for their new homes!!! four of these five went to show homes!!!! OUR FINAL LITTER OF STANDARD POODLES AND FINAL LITTER OUT OF COCOA AND YOSHI! WE KEPT TWO AWESOME GIRLS OUT OF THIS GROUP TO ARE NOW IN OUR SCHNOODLE BREEDING PROGRAM! PAST LITTER OF AKC STANDARD POODLE puppies at 7 weeks, TWO WHO ARE NOW IN OUR BREEDING PROGRAM! akc miniature schnuazer puppies pictured below are in their new homes! Thanks Irene, Kendra & Adam, Marlene & Tracey!!! Thanks so much to you for making this awesome video and for letting us use it. coming up puppies have the same bloodlines and will look just like these! PICTURED BELOW ARE OUR TWIN BOYS WITH OUR 11 MONTH OLD (AT THE TIME OF PHOTO) PHANTOM GIANT SCHNOODLE!!! please go to the breed pages for more info & pictures. lower photos are of some of our previous puppies showing what our puppies are. giant schnoodle puppy below "duke" is now at home with Tasha in texas! black & silver akc miniature schnauzer pups (past litter) shown below at FIVE weeks old! thanks to everyone who gave our past babies wonderful homes! Pictured below at 6 1/2 weeks old with jacob holding little runtie! PICTURED BELOW (2 PICTURES) ON OCT 13 2013 AT 5 1/2 WEEKS! OUTSIDE PLAYTIME!! ABSOLUTELY LOVE OUR KIDS!! 2014 litter shown below 1st time outside with our twins. Please see our giant schnoodle page for more information & more photos. Upper link is a video "Cole" of one of our last summer's Giant Schnauzer puppies the week he went to Wyoming into a service dog training program for Rollie. His friend produced the video. This is an example of what you'll get in one of our pups. Story is coming on Giant Schnauzer page. We now have several Giant Schnoodles in service and therapy dog training programs too. 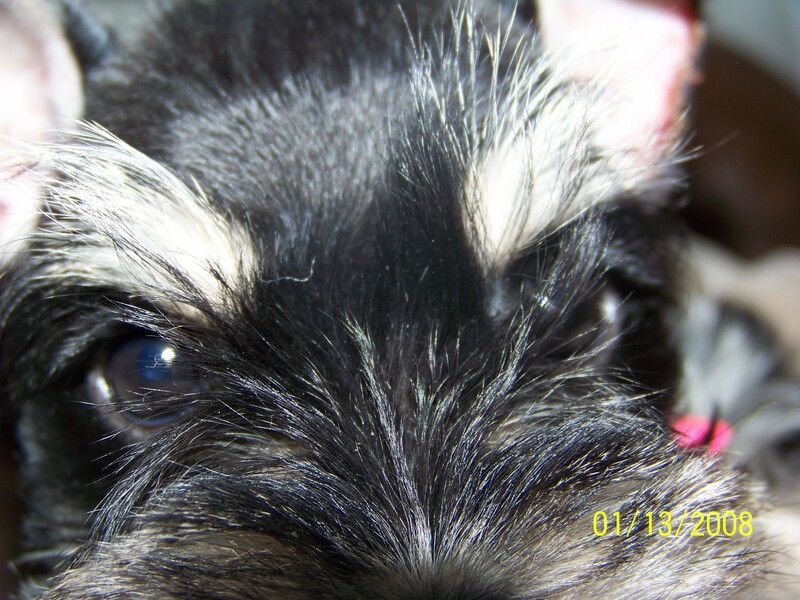 upper & lower photos are our male miniature schnauzer puppies now in thier colorado home! lower photo is of our giant schnoodle puppy who went to arizona to be trained for dustin's service dog! our past platnium silver litter of akc Miniature schnauzer puppies below! giant schnoodle male below is now at home in new mexico!!! These four pictures show puppies out for a little spin around the yard. .
our twin boys and giant schnoodle puppies playing! puppies are all extremely outgoing already at four weeks old and love peoplE! giant schoodle litter four weeks old. upper photo 1st time outside in potty play pen!! they loved it! OCCASIONALLY WE HAVE RETIRED FEMALE ADULTS AVAILABLE. MINIATURE SCHNAUZERS AND STANDARD POODLES. MINIIMUM ADOPTION FEE WHICH HELPS WITH ALL THE VET WORK, GROOMING, COLLAR & LEASH. pRICED BY AGE AND ROUTINE VET COST (SPAY, DENTAL & CURRENT VACCINATIONS) TO GET THEM READY FOR NEW HOMES. Please scroll all the way down for complete details, then go to the breed pages for more information and photos!!! e-mail us at [email protected] FOR MORE INFO. "snoop" his pedigree is almost solid top akc champions including his dam, grandparents, and that's just the beginning! are three boys are from different top bloodlines, helping our breeding program to be awesome! please contact us for details. LOWER PHOTOS ARE OF SOME OF OUR PREVIOUS PUPPIES PLAYING WITH OUR KIDS AND PUPS GIANT SCHNOODLE PUPPIES AS THEY MATURED. OUR 5 YEAR OLD'S PLAYING WITH OUR PREVIOUS PUPPIES AT 7 WEEKS OLD. LOWER TWO PICTURES ARE PUPPIES AT 7 WEEKS OLD. PLEASE SCROLL ALL THE WAY DOWN THIS PAGE TO SEE WHAT OUR PAST GIANT SCHNOODLE PUPPIES OF THIS BLOODLINE LOOKED LIKE AS THEY MATURED. This is our climate-controlled "doggy room!" Our dogs can go in and outside as they please through their doggy doors during the day. Each individual dog gets to sleep in their own special little spot at night! WE HAVE VERY BUSY SUMMERS TRAVELING AND WITH OUR CROP HARVEST. WE ARE PLAYING CATCH UP AND BEHIND ON ANSWERING E-MAILS DURING THE SUMMER MONTHS. IF YOU TRIED TO CONTACT US AND HAVEN'T HEARD BACK YET, PLEASE TRY AGAIN AS WE ARE BUSY WITH NEW PUPPIES TOO. UPPER PICTURE IS MY GRANDSON SOCIALIZING WITH ONE OF OUR PAST GIANT SCHNOODLE LITTERS.THESE THREE LITTLE GUYS PICTURED ABOVE ARE THE CONSTANT SOCIALIZERS OF OUR LITTERS. This is me with one of our past giant schnoodle puppies at 10 weeks old. IF YOU ARE LOOKING FOR A MINIATURE SCHNAUZER, PLEASE READ THE INFORMATION ABOUT MINIATURE SCHNAUZER'S AT THE BOTTOM RIGHT OF THIS PAGE BEFORE PURCHASING A PUPPY!! !WE NORMALLY DON'T HAVE SUMMER OR DEAD OF WINTER PUPPIES AT ALL DUE TO FAMILY AND RANCH OBLIGATIONS. PLEASE SCHEDULE PICK-UP APPOINTMENTS IN ADVANCE!!! 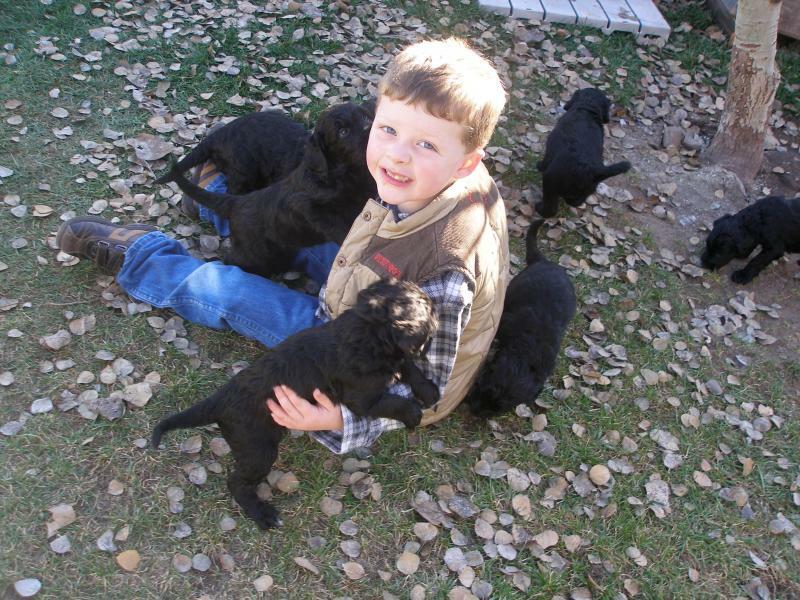 OUR GRANDSON WITH ONE OF OUR PAST GIANT SCHNOODLE PUPPIES IS PICTURED ABOVE. IF YOU ARE INTERESTED IN A PUPPY, PLEASE DON'T WAIT!!! WE RECENTLY HAD SEVERAL DISAPPOINTED CUSTOMERS WHO DECIDED ON A CERTAIN PUPPY TOO LATE & PUPPIES WERE SOLD BY THE TIME THEY MADE THEIR DECISION!!! GET YOUR DEPOSIT IN EARY FOR OUR NEXT LITTER!!!! UPPER PICTURE IS ONE OF OUR PAST MINIATURE SCHNAUZER LITTERS JUST READY TO GO TO THEIR NEW HOMES. OUR TWIN TODDLERS SOCIALIZING THE NEW PUPPIES. HYPO-ALLERGENIC TO MOST EVERYONE AND NON-SHEDDING, ALONG WITH SO MUCH INTELLIGENCE. CLEAN SMELLING TOO! THESE 2 BREEDS LOVE THEIR FAMILIES. WHAT COULD BE A MORE IDEAL FAMILY ADDITION? YOU CAN CHOOSE LARGE FOR BIG DOG LOVERS,(GIANT SCHNOODLE OR SMALL, FOR LITTLE DOG LOVERS, (MINIATURE SCHNAUZER). WE'VE BEEN WORKING ON WHAT WE THINK TO BE THE MOST PERFECT PET FOR 40 YEARS. Puppies available most spring and fall seasons!!!! PICTURES OF THESE BABIES LISTED IN THE BREED PAGES. THIS PICTURE WAS TAKEN IN OUR BACK YARD WITH OUR RANCH IN THE BACKGROUND. 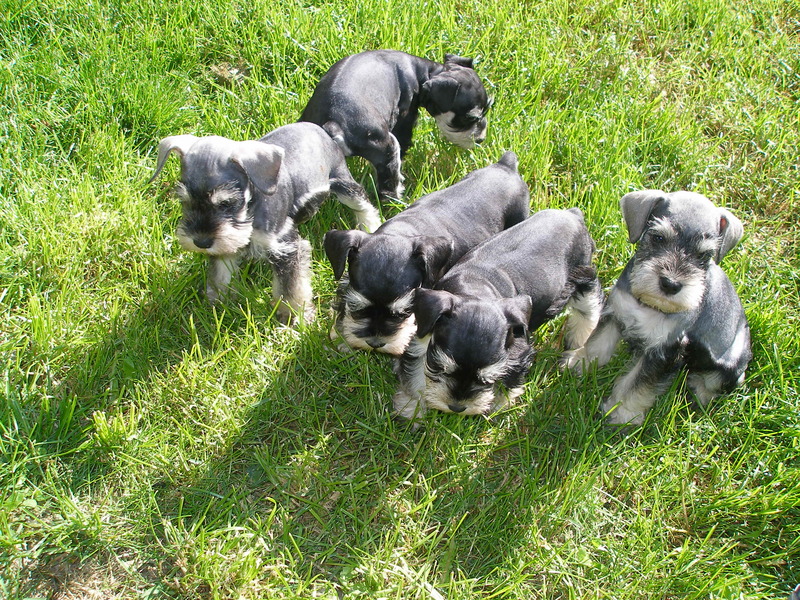 THIS Was a few SUMMERS' AGO BEAUTIFUL MINIATURE SCHNAUZER LITTER. ALL OUR MINI PUPPIES WILL LOOK SIMILAR TO THESE BEAUTIES. We are in gorgeous western Montana area and own and live on a beautiful 650 ACRE ranch and lease another several hundered acres where we raised (and are still raising) our family consisting of twin toddlers, a toddler grandson and four grown children who love to come and help us out often. We have horses, ponies, cattle and raise hay, wheat and grain crops. The back of our ranch is backed up to thousands of acres of forest service land and mountains. We have a family project lasting 40 years of breeding the best possible Miniature Schnauzers, concentrating on health background, solid loving temperment and correct conformation. We have been involved in Giant Schnauzers for 40 years also, and even had A DECADE in the AKC SHOW RING. Several years ago we joined with a top Standard Poodle breeder in our area who had the same ideas about creating the best possible. We have the Giant Schnoodle in creation after many years of research and raising the upcoming parents of this wonderfully thought out hybrid cross. We concentrate on the same things as the little ones for this larger non-shedding and hypo- allergenic to most puppy. A lot of people want a big dog, but can't handle the dog hair all over their home and clothing. Many are just plain allergic to dogs and this hybrid fills all their needs. These are so cute from puppyhood and as adults. Most have big, soft black curls. They look like a teddybear and the temperments are sweet and trainable. All puppies get a great start here. They are totally socialized with children, adults, and other animals. All puppies are handled constantly from birth to their new owner's arms. Our parent dogs all have to pass every health & temperment test to be in our breeding program. We are not a big breeding kennel. We breed for top quaility, not quantity. We strive for "The Best of the Best"! FOUR PICTURES ABOVE ARE SOME OF OUR PAST GIANT SCHNOODLE PUPPIES. We work with two excellent veterinarians to make sure our adults and puppies are always in the best of health. They are fed the best available food, and receive all vaccinations on time. We only have a few litters a year and our breeding females are retired after an average of 3 litters. We feel after this, they have done their job and desrve the best of life just being house babies afterwards. We offer a health guarantee and forever help with your questions or concerns. New puppies come to you with a puppy kit, toy, collar and current vaccinations and worming. If flying to you, your new puppy will have the special health certificate. We would love to have everyone come to the ranch when picking up your new puppy to meet the whole family & see how your puppy was raised. We know that isn't always possible, so we will ship on the best flight possible also. We have 30 years of happy customers, and we'll be here for you too! If you are thinking about one of these wonderful non-shedding, hypo-allergenic, and intelligent family members (large or small), please contact us! TOP PICTURE IS ONE OF OUR PAST GIANT PUPPIES. BOTTOM PICTURE IS OUR YOUNG ADULT BLACK & SILVER COLORED OUT OF OUR GREAT SIRE "ACE". IF YOU ARE LOOKING FOR A NEW MINIATURE SCHANUZER, PLEASE READ THIS INFORMATION!!! !THERE ARE ONLY THREE COLORS OF MINIATURE SCHNAUZERS ACCEPTED BY THE AMERICAN MINIATURE SCHANUZER CLUB WHICH REGULATES THE BREED STANDARD FOR THE AMERICAN KENNEL CLUB. THESE COLORS ARE SALT & PEPPER, SOLID BLACK, & BLACK & SILVER. WHITES AND PARTI COLORED ARE NOT ACCEPTED (DISQUALIFIED)AND BREEDING THEM IS NOT ACCEPTABLE. THERE ARE SOME BREEDERS OUT THERE CALLING THEIR PUPPIES "TOYS, & TEACUPS". THERE IS NO SUCH THING!!! MOST OF THEIR BREEDING STOCK COME FROM PUPPY MILLS IN MISSOURI, KANSAS OR TEXAS. THEY HAVE NO CLUE AS TO THE HEALTH OR GENETIC BACKGROUND OF THEIR DOGS. THE CONFORMATION IS APPALLING AND NOT EVEN CLOSE TO WHAT THEY ARE SUPPOSED TO BE!!! LONG BACKS, LOW TAIL SETS ETC.THEY ARE ASKING RIDICULAS PRICES ON THESE SUPER POOR QUALITY DOGS!! !SOME CLAIM TO HAVE CHAMPIONS IN THE BACKGROUND! IF THEY ARE NOT AKC OR ANOTHER COUNTRY'S CHAMPIONS, IT MEANS NOTHING!!! THERE ARE MANY INHEREITED CONDITIONS IN MINIATURE SCHANUZERS WHICH SHOULD BE CLEAR IN THE BACKGROUND OF ANY BREEDING DOG. MAKE SURE YOU DO YOUR RESEARCH BEFORE PURCHASING A NEW PUPPY. YOU MAY BE ASKING FOR MUCH HEARTACHE IF YOU DON'T. 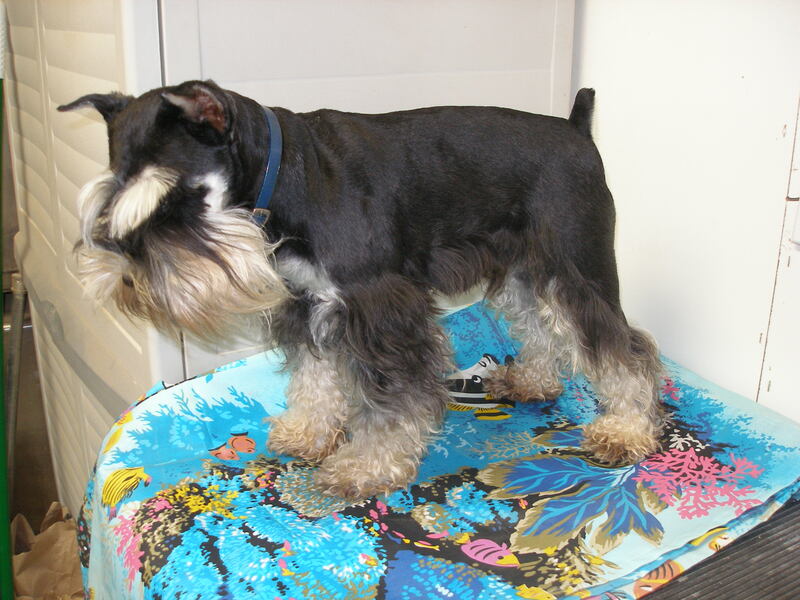 BELOW IS EXAMPLE OF WHAT A MINIATURE SCHNAUZER STRUCTURE AND LOOK IS MEANT TO BE IN THE SHOW RING! LOOK AT THIS SALT & PEPPER BEAUTY, THEN LOOK AT OUR SIRE PICTURES TO COMPARE STRUCTURE. NOW LOOK AT THE OTHER WEBSITES YOU'VE BEEN VISITING. THIS WILL GIVE YOU A GREAT VISUAL! OUR GOAL IS TO EDUCATE. NOT JUST TO SELL A FEW PUPPIES. JUST MAKE SURE TO BUY FROM THE BEST BREEDER YOU CAN FIND. YOU WILL BE SURPRISED THAT AN EXCELLENT QUAILTIY DOG IS PROBABLY PRICED LESS THAN A POORLY BRED "BACKYARD BRED" DOG. PLEASE CONTACT US FOR MORE INFORMATION AND TELL US AS MUCH ABOUT YOURSELF AS POSSIBLE AND WHAT YOU WOULD LIKE IN A PUPPY. WE LOOK FORWARD TO HEARING FROM YOU! Copyright this business. All rights reserved.